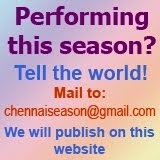 This is a website that aims at putting together all the events & concerts during the December season in Chennai. PLEASE NOTE THAT WE ARE NOT ORGANISERS OF MUSIC CONCERTS. HENCE, PLEASE DO NOT MAIL YOUR BIODATA TO US. Excellent arrangement!Wish you all the post! 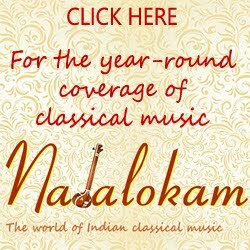 Well... it would be nice if the first ever web portal on indian classical arts - ART INDIA www.artindia.net launched 12 years back, also gets listed under Music and Dance Websites. Thank you. Art India is now listed. Thanks for your note. Sir, May I please know the ticket rates for Sri J.Venkatraman's Lec-Dem on December 18th? Thank You. J. venkatraman's lec-dem session is free and open to all music enthusiasts. Hello, Is there a way to buy tickets online to any of the programs in any of the Gana Sabhas? Brahma Gana Sabha tickets are for online booking at whyq.in. Most other sabhas offer advance bookings at the venue one day in advance. Here is a golden opportunity to participate in online Singing Compeition. Contest is open for all age groups and it is Free contest. Log on to www.swarasupersinger.com for details. Submission period started. I am coming from USA to attend the Naradha Gana Sabha concerts. Where can I buy the tickets online? Thanks for your time. There is no facility to buy tickets online as of now. It is sad that the organisers haven't given a serious thought to this. Any idea about tickets at The Music Academy? Last year for some musicians, they sold tickets only on the morning of the concert; will that happen this year too? I am not from Chennai. Sir, May I please know the ticket rates for BOMBAY JAYASHRI mam concert on December 30th? Thank You. Is there any Bharatnatyam Dance Performance going on December 28, 2017 in Chennai? I am planning a group tour of south India and my participants are very interested in viewing a Bharatnatyam Dance in Chennai. We are also planning to visit Mamallapuram, Pondichery, Thanjavur, Kothamangalam and Madurai later - please inform me at indiatraveller@gmail.com if there are any performances in these cities in December 2017.